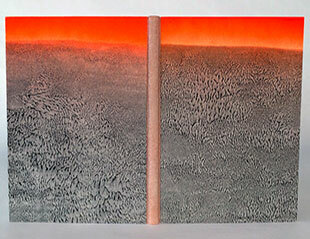 Bonefolder Blog, 2012: "Amy Borezo received an MFA in Painting and Printmaking from RISD in 2000. After graduating, she worked both as a bookbinder in a production bindery and as a book mechanic at Daniel Kelm's Wide Awake Garage where she learned that you can reinvent the book each time you make it. Amy is now a contemporary book artist and the proprietor of Shelter Bookworks, an edition binding studio in Western Massachusetts." Orange, Massachusetts: Shelter Bookworks, 2017. Edition of 45. 12.625 x 12.75"; 48 pages. Contains 18 handmade editioned paste papers. Printed on Reich Aveo paper made from 90% sugarcane stalks and 10% linen/hemp. Printing from photopolymer plates (made by Boxcar Press) on a Challenge 15mp press. Text set in Futura and Deepdene, italics in Arno Pro. Bound in red cloth over boards. Laid in a cloth-covered clamshell box with titles on the spine. 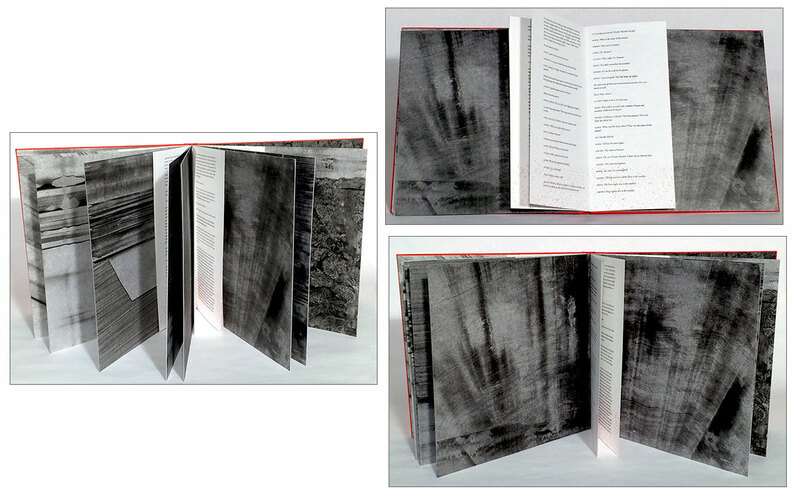 Images, design, printing, and binding by Amy Borezo. Signed and numbered by Borezo. The text for Kingdom of Earth is from THE MAGIC TOWER and Other One-Acts, copyright ©1967 by the University of the South. Reprinted by permission of New Directions Publishing Corp.
"The setting for Kingdom of Earth is a character in itself and carries throughout the play a tension full of apocalyptic foreboding. A storm is flooding a nearby river. A property owner upriver is expected to dynamite his levee if the river continues to rise, which will flood the Mississippi Delta farmhouse in which the action is taking place. The sound of the river pervades the play with a constant rising murmur while the three main characters enact a dark dance around one another that touches on issues of race, sexuality, and survival. "The size and structure of the book allows for an immersive experience, with abstract imagery evoking water, floods, and breached levees, surrounding and engulfing the viewer. The action of the play occurs in the center of page spreads, with imagery stretching out on either side. The imagery is created through the technique of paste paper making, a traditional handmade design process. "The only colors mentioned in the play are grey and red. Red is used to symbolize the main female character, Myrtle, and female sexuality, but also blood and death. On each text page throughout the edition, the color red is used as a rising tide of graphic imagery that creeps up the page as the play progresses, just as the flood water rises through the course of the play." Orange, Massachusetts: Amy Borezo, 2013/2014. Edition of 40 (35 standard + 5 deluxe sets). 9.5 x 12"; 16 pages. Accordion structure. Printed letterpress: 1 - 20 printed and bound at the University of Dallas by graduate students in the printmaking program; copies 20-40 printed and bound by the artist in Orange, Massachusetts. Numbered and signed by the artist on the colophon. Paper covered boards. Laid in cloth-covered clamshell box. Fourteen pages of complex lines and circles constitute an artistic interpretation of genealogical information using as its basis an 11th-century diagram. 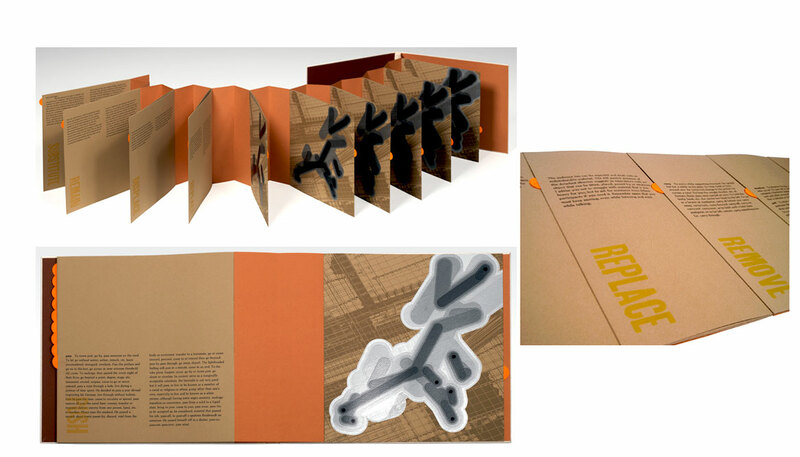 Amy Borezo: "Some Lines is an artist’s book that emerged from research into the earliest known branching diagrams. My interest lay in the complex computer science of artificial intelligence. However, as a layperson wishing to comprehend AI, I felt the need to go back to the very essence of how computers are taught to 'think.' This lay in Aristotle’s Categories, out of which came the Porphyrian Tree—a branching diagram simplifying Aristotle’s ontological categories into their most basic, visual form. "During further research, I discovered another early diagram, but with a narrative structure—the genealogy of Jesus. The earliest form of this long horizontal branching tree is in a manuscript of the Beatus, painted by the monk Facundus in 1047. This early Christian infographic shows each figure from Adam and Eve through Jesus as a roundel linked to another roundel through a line of birth or marriage. "This diagram holds within its form many complex questions that interest me—about the nature of authority, narrative through abstraction, and drawing through time. The subject of artificial intelligence is for another artist’s book, one that I may or may never complete. In the diagrams within this book, I feel confident that I started at the beginning, literally and figuratively. Some Lines is the abstraction of a large mythos, a reduction of the original to pure visual information, black circles connected to other black circles with lines. Yet patterns of narrative remain, even in abstraction. "In 2013, I conceived this book to be printed in four days with graduate students as an Artist in Residence at the University of Dallas. I was unaware until arriving on campus that the University of Dallas is a Catholic University. It was fascinating to discuss this work on that campus with students and visitors. One student asked me, could it really have been 'any [genealogical] line' as the title of the book implies? Are these just 'some lines'? The diagram is interesting to me as a person living in a culture in which this particular narrative has some weight and complexity. These both are and are not just some lines." [Orange, Massachusetts / Hanover, New Hampshire]: Amy Borezo, 2010. Edition of 20. 7.75 x 11.25 x 1.75"; 14 pages. Accordion structure. Printed on 100% rag Holyoke Fine Paper. Hand-set 14 pt Caslon metal type for text. Title in Futura. Images printed using photopolymer plates. Laser cut figures. Paper covered boards. Housed in linen covered clamshell box. Each page consists of two printed sheets glued back to back, creating a thick, rigid panel that stands on its own. 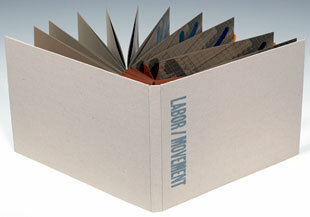 A continuous sheet of tyvek runs between the pages that form the panels, acting as a hinge. Amy Borezo, catalog: "The artist's book 'Raising the Supine Dome' depicts the visionary architect Buckminster Fuller's first attempt to construct a geodesic dome with a class of students at the experimental school, Black Mountain College, in 1948. The actual construction was a failure because the dome did not rise, but Fuller saw each failure as a way of getting closer to true understanding. The book presents the event as a stripped down, schematic tableau of figures on a white field amidst sinuous red strips of construction material, emphasizing the beauty and poetry of the failed event. The red lines become drawings in space, sprawling and expressive, unwilling to coalesce into the tidy geometry of Fuller's built universe. The figures attempting to erect the dome are physically cut out of the paper, revealing a triangular grid beneath, representing the point at which individuals lose their unique characteristics when working together as a group toward a specific goal. The text contained within the book is a found poem, taken from a variety of primary sources and edited, altered and combined to give the reader a sense of time and place as well as a basic narrative of the event. The writings of Buckminster Fuller and excerpts from the poem about Fuller 'The Praises' by Charles Olson combine with anecdotes from Fuller's class at Black Mountain by Elaine de Kooning. 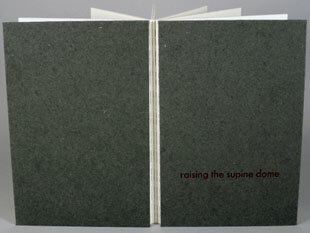 The text is placed along the bottom edge of the book in a subtle and sloping downward arc, echoing the shape of the supine dome that refuses to arc upward. The accordion book's stiff leaves can be paged through as a codex or can stand upright and extend out fully and be viewed from both sides as the play of light and shadow interacts with the cut figures." Orange, Massachusetts: Amy Borezo, 2016. Edition of 40. 7.3125 x 10.3125"; 56 pages. Relief printing on Zerkall Book paper from photopolymer plates on a letterpress. Body text set in Caslon, titles in Futura. Pages sewn onto a shaped concertina. Paste paper over boards with a buffalo suede spine. Housed in a presentation box. 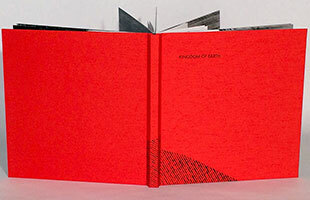 Images, design, and binding by Amy Borezo. Signed and numbered by the artist. 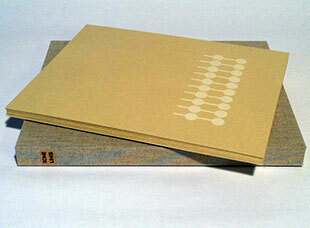 Shelter Bookworks: "H.P. 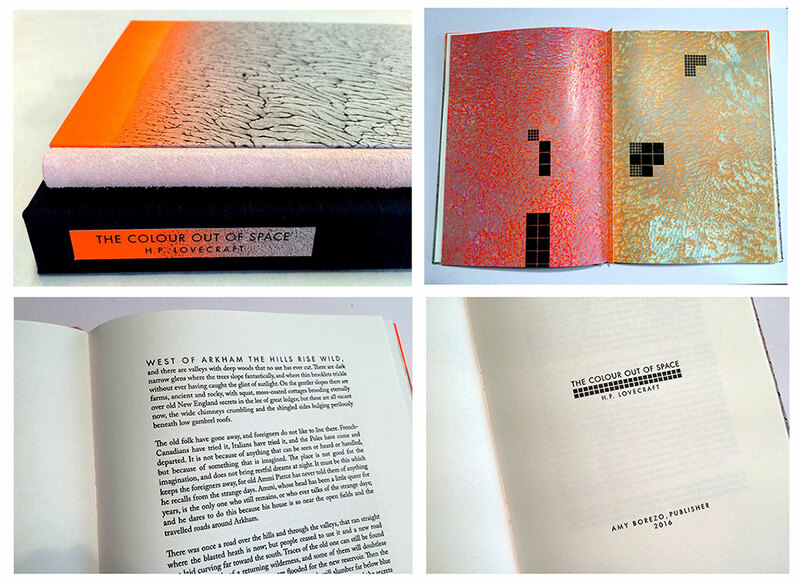 Lovecraft considered 'The Colour out of Space' one of his best stories. In this narrative from 1927, Lovecraft blends horror and science fiction to create a dread terror of the unknown. A meteorite falls on a farm in central Massachusetts and causes devastation in the form of a mysterious, gradual toxicity of the land, vegetation, and people, often described as a strange colour. The location of the fallen meteorite is also the future site of a reservoir that will eventually be a major water supply for a large city. "This contemporary fine press edition of the story includes an introduction by Lovecraft scholar S.T. Joshi and 14 color images by Amy Borezo. The artist lives near the supposed site of this fictional tale and frequently walks the old roads of the towns now underneath the Quabbin Reservoir. In creating the imagery for this work, the artist was interested in the inherent romanticism of this familiar landscape as well as Lovecraft’s own professed dislike of progress and modern industrialization. The toxicity from the meteorite at the site of the reservoir could be seen as a metaphor for the effects of modernity itself. The images reflect these ideas in abstract form. "The text for this edition was provided by S.T. Joshi from his recent publication, H. P. LOVECRAFT: COLLECTED FICTION: A VARIORUM EDITION [Hippocampus Press, 2015] and is derived from a typescript at Brown University, evidently prepared by F. Lee Baldwin for a proposed reprint of the story (c. 1934) that never happened. It has some revisions in pen by Lovecraft, so presumably it represents his final wishes for the story." [Orange, Massachusetts / Hanover, New Hampshire]: Amy Borezo, 2012. Edition of 25. 12.75 x 15.125 x 1.5"; 20 pages. Printed on Vandercook SP-20. Handset metal and wood type, body text in Palatino. Images printed from photopolymer plates. Concertina spine structure expanding from back pastedown. Pages sewn into mountain fold of the concertina. Cloth covered boards. Bound by artist. Housed in cloth-covered clamshell box lined with orange papers that match tabs on pages. Amy Borezo, Prospectus: "This book depicts movement visually in book form, while calling attention to the complexity of everyday human activity. The book tracks the motions of seven workers over a brief period of time with lines that change in length, width, and color. As the segments of motion grow, page by page, lines intersect and interact, joining to form an intricate pattern on top of a static industrial floor. Shades of silver ink overlap to create a rich, opulent field that belies the seemingly humble activity. 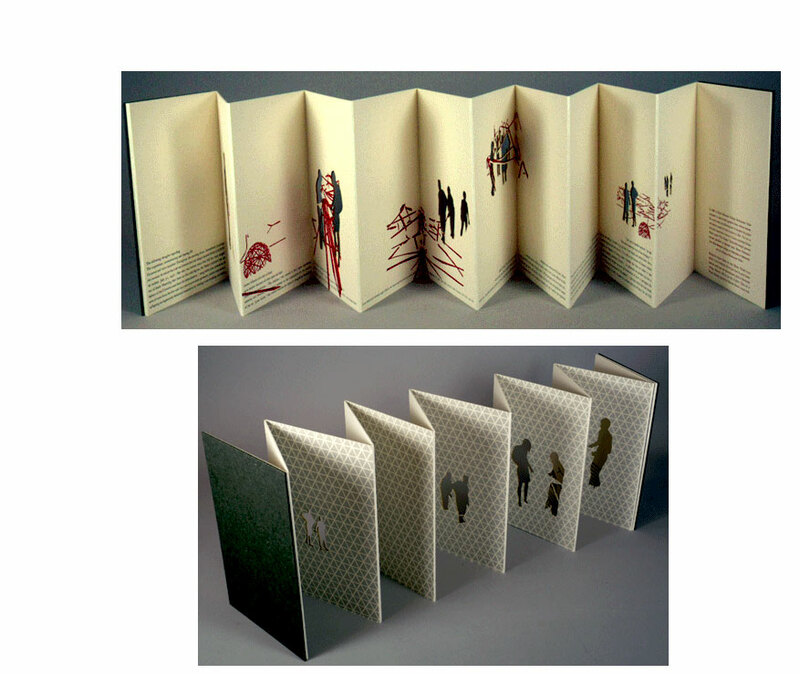 Each folio is sewn onto the mountain fold of a concertina. 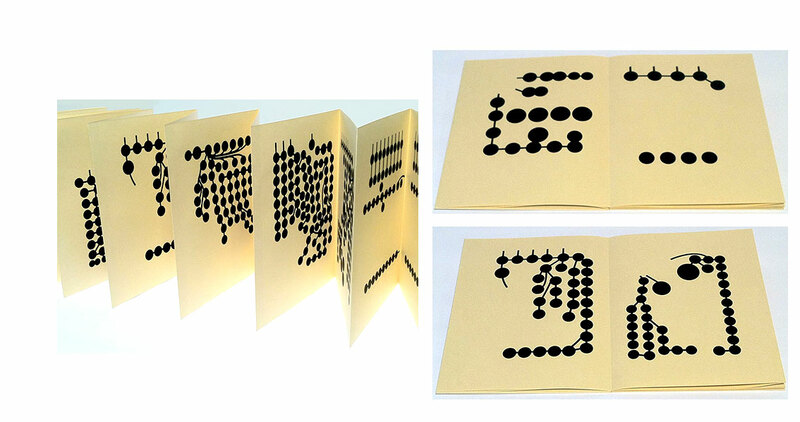 When the concertina is fully extended by the reader, a portion of each page can be seen simultaneously with each other page, exposing the frame by frame growth of the movement pattern. The reader/viewer is implicated in the performance of the book and asked to be aware of her movements as she interacts with the piece. "These abstract reductions of the movements of workers are inspired by the work of Frank and Lillian Gilbreth who developed time and motion studies in the early 20th century to improve worker efficiency and productivity. Their work broke down any job into a series of discreet movements that could be repeated by anyone, obviating the need for specialized and skilled laborers. "The imagery is paired with 'Lecture on Moving,' a text by Yvonne Rainer, reprinted with permission of the author, originally published in Aspen magazine, 1971. Yvonne Rainer is an avant garde dancer and filmmaker whose dance work often highlights everyday movements. In the text, Yvonne leads a group through an exercise designed to make the participants more aware of their physical presence in the world. She lists the dictionary definitions of a variety of action words, that, when placed in the context of the 'performance,' become evocative of more than their simple definitions." The images, although "inspired" by the Gilbreths' work, were actually created by Borezo, who "literally trac[e d] the movements of seven anonymous construction workers for a stock, generic video [produced by the Gilbreths]."